Food rationing and shortages in Turkmenistan have been consistently reported in regional news since 2017. The Central Asian mineral resource rich country’s authoritarian government hasn’t officially denied the reports of increasing food supply difficulties, nor has it confirmed that there are issues. 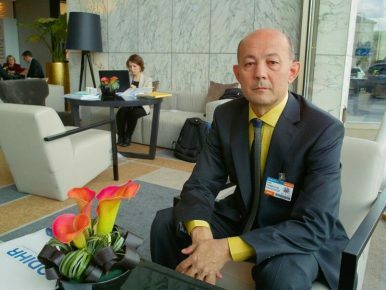 Turkmen activist-in-exile Fareed Tukhbatullin, who is also head of the Vienna-based Turkmen Initiative on Human Rights, shares his knowledge of the situation and explains how the nation’s stagnated economy led to the current food shortages in Turkmenistan. This interview was previously published in Russian by the Central Asian Analytical Network. What is happening with the food shortages in Turkmenistan? Why is it so controversial and how can we distinguish the truth from false information? It is obviously known that Turkmenistan is a closed country that does not invite foreign journalists or experts from international organizations, so no one can get reliable information about what is actually happening in the country. Most of the information we publish comes from our correspondents and monitors inside Turkmenistan, from where we also collect information as a human rights organization. Let’s sort out what the conflicting information is. We always point out that the queues for products happen in the food stores that are controlled by or owned by the state; we emphasize this. Our reports most often are used by various media outlets, including those “yellow” newspapers that, without going into details, publish materials with screaming headlines that there is nothing in Turkmenistan and widespread hunger, etc., which, of course, does not correspond with reality. Official state media are demonstrating food abundance in Turkmenistan. The reality is that the government regulated food items like bread, flour, vegetable oil, and eggs are now in short supply and even in the capital there are queues, and sometimes physical fights break out in queues in rural areas. We posted photos and videos of such incidents on our website and so did Azatlyk radio [RFE/RL’s Turkmen language service]. As to food shortages, it is necessary to clarify that, for example, a loaf of bread and flat bread, that cost one manat, two years ago were abundant. The long queues were just for cigarettes. People used to buy as much as they wanted, especially large families, and, as a rule, people in Turkmenistan take three or four loafs of bread per family. The problems with access to food became visible since last year, and this is primarily due, in my opinion, to the difficult economic situation in the country and restriction of the open conversion of the Turkmen manat. It is possible to buy U.S. dollars in Turkmenistan only on the black market, where the difference between the official and unofficial rates is five-fold [for example: 3.5 Manat for 1 USD — a state rate from 2015 after a 20 percent devaluation — and 18 Manat for 1 USD — the current rate on the black market]. Therefore, businessmen that imported flour from Kazakhstan in the past now are forced to reduce their import purchases. There is Turkmen flour for sale, but it is of poor quality, and people complain that it is impossible to bake bread from it. Ultimately, the volume of imported food products has now declined due to the fact that there is no foreign currency in the country. This, in turn, causes a shortage of food in Turkmenistan, since for the domestic production of the same flour or vegetable oil, it is necessary to have not only raw materials, but also to upgrade technologies and equipment, buy ingredients, etc. Unfortunately, because of all of the above, there are now less bread, flour, vegetable oil, and eggs in the country. Products at higher prices — expensive flour, etc. — one can buy in private stores and bazaars. Wealthy families can afford to maintain their lifestyle, but the fact is that, according to various sources, about 60 percent of the population in Turkmenistan is unemployed. Many in recent years have left the country and labor migration is part of life in Turkmenistan, too. But while in Uzbekistan and Kyrgyzstan, migrants can go to Russia, Turkmen citizens cannot go to Russia. They flock to Turkey, because Turkmenistan has a visa regime with almost all countries in the region except Turkey, so you can stay in Turkey illegally and earn little cash. Until recently, families in Turkmenistan have survived on remittances from Turkey. For example, $100 was enough to feed a family in Turkmenistan for a month. But now, due to currency problems, Western Union cashes out not in USD, but in manats, recalculating at the official rate. Additionally, from next year, the authorities announced a planned increase for gas and electricity bills and so on. Social benefits are canceled. Businessmen are actively withdrawing capital from Turkmenistan and leaving the country altogether. All this speaks of the deplorable economic situation in the country. Some argue that even if food shortages do occur, that is not critical. For example, they say that the queues are for cheap food products, and there is no shortage of products at the bazaars. First of all, it should be noted that the queues are in state stores, where prices are regulated and, of course, products are cheaper than the ones sold at bazaars. The point is not that Turkmenistan now resembles Venezuela, where there is an acute shortage of food. The situation in Turkmenistan is not like that. We always clarify that the queues occur at the state-owned and managed grocery stores. Then there is plenty of food to buy at bazaars? Yes, food products can be bought at bazaars, but the price is two or three times higher. But due to unemployment and the problems with remittances, the population is poorer and is trying to buy cheap groceries. You mentioned 60 percent unemployment. This is a huge number. What is the official unemployment figure? Official information is not available. Generally, finding official statistics is nothing but trouble. For example, the last census was taken in 2012. But its data has not been published yet. Even the number of the population is unknown. As for unemployment, average wage, consumer basket, etc., the Turkmen authorities do not publish such figures. The only thing that they published literally the other day was the budget for 2019, which was adopted by the parliament. The budget for next year was reduced by 12 billion manat [in dollar equivalent, state budget revenues in 2019 should reach $29.96 billion if the official exchange rate applies (3.5 manat per USD) or $4.66 billion converting to the black market exchange rate (18 manat per USD)]. Even the 2019 budget does not have detailed information. The authorities simply show the revenue and expenditure parts. That’s it. And you know, the Turkmen authorities sometimes react to our publications or news from RFE/RL. The state channels show stores with full counters, buyers — as a rule, beautiful women — with full carts, demonstrating that in fact there is an abundance of food in Turkmenistan. Here bread is baked, candy is here, etc. So the word “problem” in the Turkmen official press doesn’t exist. Yes, there are bazaars. But it cannot be said that the bazaars have an abundance of products, completely. For example, poultry — the cheapest meat, which people can afford — is not always available even at high prices. We published recently a report [about bazaars] where on the shelves packaged chicken is shown, but inside the packages are stuffed with cotton. This is to demonstrate that chicken is on sale. There are problems, too. Turkmenistan today is probably resembling the times when we stood in line for bread, flour, and milk in the years 1990-91. In Turkmenistan, the food shortages then lasted until 1993, because we did not make our own bread then. There were coupons for bread and flour, and it was not always possible to redeem them. In those days, people were in queues all night and waited. Are there alternative sites or news sources where people publish photos or videos about food scarcity? No, there are no such sources. Social networks in the country are not accessible. Sometimes there is access to Odnoklassniki [a Russian social networking website], but there everyone is under his or her own name and people are afraid to publish such things because they fear consequences. Our organization in Turkmenistan employs several people who monitor the situation, working underground. They manage to take photographs and send information to us. 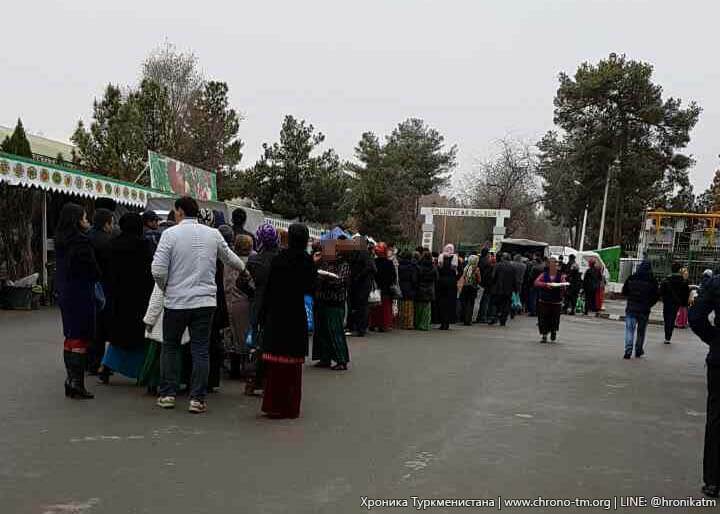 This photograph shows a long line at a state-owned food store in Turkmenistan. How does the food industry generally work in the country? What products are sold through state-owned and private stores? For instance, there are state-managed and private bakeries. Some of the products of the state enterprises are still sold to private owners for profit. Most of the baked goods are sold through the state-owned stores under “Turkmenbakaleya” of the Ministry of Trade. Private companies produce canned food, which the state has practically discontinued to produce. Such categories are only available in commercial stores. Soda like Coca-Cola is produced locally. There are serious problems with cottonseed oil, which is in short supply in Turkmenistan. Cottonseed oil is produced by local businesses. What products are imported from abroad to Turkmenistan? Are there any hard numbers? Unfortunately, no. Statistics, as mentioned earlier, cannot be obtained in Turkmenistan. Until recently, the private sector was importing goods. Now, due to problems with foreign currency exchange, a part is imported by the state. Although the president himself said that it is necessary to switch to self-sufficiency and self-supply, it’s one thing to say it, another thing to deliver. At the moment there are a lot of imported products, including flour from Kazakhstan. There is an organization, the Association of Industrialists and Entrepreneurs of Turkmenistan, which operates under the government, that unites several large companies that are under control of the Turkmen president’s nephews and relatives. And they have access to currency exchanges. So they have access to foreign exchange transactions and can easily import goods from other countries. In addition to flour and vegetable oil, even fruits and vegetables are mostly imported (apples, potatoes, onions, for example, from Iran). What is the situation with livestock? Livestock is there, but with years of underdevelopment, inherited following the collapse of the USSR. We Turkmen could not set our agricultural sector on the free market path and are still trying. The state controls 90 percent of agricultural production. There is still a state order, which in Soviet times was issued by Gosplan, for cotton, wheat, meat, etc. Because of that, agriculture in Turkmenistan is under strain. For example, this year was marked with dry weather conditions having an impact on water supply, as a result of which fodder crops could not be produced as the plan required. Livestock is declining. We know this, but there are no statistics to confirm this. Ordinary people get rid of large and small size cattle, because there is nothing to feed them with. All this goes to the cattle bazaar, but it does not affect the prices. Someone profits from keeping high prices. Generally, an irrational economy has developed in Turkmenistan — a mixture of market- and administrative-command. Do the average rural families in Turkmenistan have their own livestock — one or several cows, horses, and sheep to feed all family members? Yes, of course. A small note, horsemeat is not eaten in Turkmenistan. And the neighbor has the same cow, and it’s impossible to sell him milk. Some carry milk to the city to sell, others cannot, because it’s too far. There are no prosperous farmers in Turkmenistan. What about private land for growing crops and what not? A garden is called a “mellek” in Turkmen. Usually it is 0.16 or 0.32 hectares in size. You can grow anything. But there is such a system as renting land in Turkmenistan. People are forcibly imposed either 2 hectares or 4 hectares and told to plant cotton or wheat. In cases like that, people are trying to cultivate other vegetables within those hectares of rented land — carrots, potatoes, and everything that can be sold on the market. But there are special commissions that check on these hectares, and even if cotton or wheat can be grown with the other types of vegetables within the cultivated land, such practice is strictly prohibited. The commission, if it finds unauthorized vegetables, immediately calls for the tractor, which comes and destroys the “unauthorized” plantings. We wrote recently about a case when the farmer died because he had nothing to feed his family with after one of these commissions destroyed what he sowed. Unfortunately, the same practices that existed during the Soviet Union remain in the agriculture of Turkmenistan today. The Soviet collective farms were simply renamed “Daikhan” associations, where each family is obliged to take two, four, or six hectares, depending on the number of family members. A planned economy in the agricultural sector is very detrimental to the development of the country. Many villagers try to relocate to the cities in order to find sustainable work with a more or less normal salary. However, there is still a propiska institution, which means that it is impossible to work where a person is not registered. How is the situation in Ashgabat? It is relatively better in the capital. It is also easier with work, but these are state structures — the education or health care system. Anyone who works for the government has a better income. Businessmen belonging to the Association of Industrialists and Entrepreneurs of Turkmenistan are well off. But even in Ashgabat, you may see queues for cheap products. What is the average wage in Turkmenistan? There is no data on the average salary. The minimum is 715 manat per month. According to the official exchange rate, that will be $190-$200, and at the black market rate, $40. Turkmen mostly use the black market currency exchange rate. Now, it is around 17-18 manat per USD. At the same time, the official rate is 3.5 manat. The salary of teachers is almost three times the minimum, 1994 manat. The monthly wage for a teacher is the same throughout the country. Being a teacher in Turkmenistan is good luck. If someone in the family is a teacher, then by Turkmen standards, this is a prosperous family. Do Central Asian neighboring countries supply food to Turkmenistan? Would the development of regional trade help? Flour is imported from Kazakhstan, and practically nothing from Uzbekistan. Borders are closed. Earlier it was possible to go to Uzbekistan for three days, now there is no such thing. But there is a part of the population that has dual citizenship (Russia and Turkmenistan), and those who have a Russian passport can freely cross the border. The presidents of Uzbekistan and Turkmenistan have already met several times, but, unfortunately, there haven’t been any tangible changes for the population. The Uzbek president offered to simplify the border regime, because an ethnic Uzbek population lives on the Turkmen side. For Uzbeks in Turkmenistan, in order to travel to Uzbekistan, one must obtain a visa, for which one must pay, and which can only be obtained in Ashgabat. [Uzbek] President Mirziyoyev offered to return to the former simplified rules on the border, but the Turkmen side refused. How many Turkmen migrants are abroad? My estimate is at least 500,000. Most of them work in Turkey, much less in Russia. Many Turkmen students studying abroad — in Belarus, Ukraine, Turkey, and other countries — come to us for advice on how to stay abroad after graduation. For example, how to extend a visa or how to get a residence permit. Some 90 percent of ethnic Kazakhs in Turkmenistan left for Kazakhstan under the “oralman” [repatriation] program. Ryskeldi Satke is a contributing writer with research institutions and news organizations in Central Asia, Turkey and the United States.